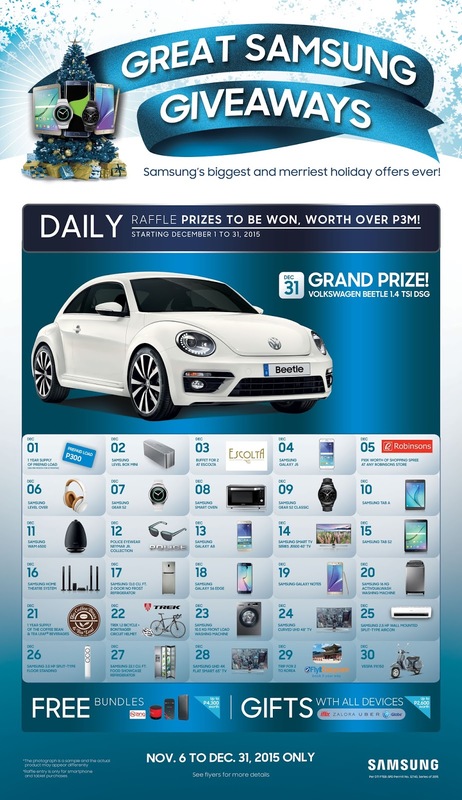 Win Samsung Gadgets & Accessories, Premium Vouchers from e-commerce sites or a limited Edition Volkswagen Beetle with the Great Samsung Giveaways 2015! Samsung has assembled a dazzling line-up of raffle prizes that makes purchasing a Samsung mobile device even more exciting. The daily raffle prizes include a buffet for 2 at Escolta; sunglasses from Ideal Vision; a year’s worth of coffee from Coffee Bean and Tea Leaf; trip for 2 to Korea; Trek road bike; Samsung digital appliances and Samsung gadgets; P10,000-worth shopping spree at Robinson’s Department Store, among many others. And for the grand prize on December 31, the lucky winner will be driving home a sweet new ride – a limited edition Volkswagen Beetle! The raffle is not just the only bonus. Since it is indeed the most wonderful time of the year, every purchase of select Samsung mobile and tablet devices gets you FREE bundles worth up to P4,300. Take home freebies such as, battery packs, memory cards, pocket Wi-Fi units, Bluetooth speakers, and many more, freebies vary depending on the purchased bundle. Participating products include the Samsung Galaxy S6 edge+ and Galaxy Note5, both of which have revolutionized the way people use their smartphones.